May 9th is going to be a very busy day! I will be participating in two art auctions and one art festival. 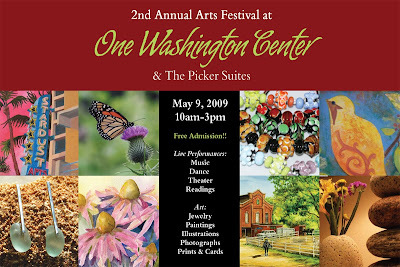 The Art Festival will take place in downtown Dover, New Hampshire at One Washington Center. I will be selling small paintings, prints, handmade books, and jewelry made from recycled materials. This is the second year that this event will take place. Last year's festival was a lot of fun for everyone involved. There were many artists selling their original pieces, dancing, music, food, and fun events for kids to get involved in.